Andrew recently took the helm in the kitchen of our new SW café, and we are certain he will win you over with his quick wit and zest for life. Bright-eyed and standing at nearly 7 feet tall (slight exaggeration), he has everything in the kitchen humming in perfect pitch. We asked him a few questions about Lovejoy and, of course, cooking. Get to know this fine fellow more, and read the Q & A session below. Q: How did your culinary career start? A: I was really, really, good at washing dishes – too good apparently. Q: What is your favorite thing about the cooking lifestyle? A: I like being able to be creative with food, and it is a perfect cover for listening to silly music all day. Also, it allows me to party. Q: What is your favorite thing to make? A: The tuna tartine is by far my favorite thing to make. Not only is it super pretty, but it tastes incredible. The flavors of calabrian chili marinade, shaved fennel, and kalamata olives are far superior to the played out mayo-based nonsense. Q: What is the best song for cooking? Q: What has cooking taught you about life? A: Cooking has taught me that you have to create a positive environment for yourself. Whether that takes the form of being in a clean space with the right music and equipment, or if it means creating a happy home life, the end product is always better when you feel better. Q: What is your favorite random ingredient to add? A: That would be a toss up between salt and lemon juice. Q: What did you do before you became a cook? A: Played sooooo much lax (that means Lacrosse, Portlanders!). Q: Why did you choose to work at Lovejoy? A: It’s hard to decide between the love and the joy. Actually, the wanted ad mentioned that you must be able to rock a bandana. I showed up to the interview wearing one, probably with a sharpie hanging out of it, and the rest is history. Q: If you could have any super power to help you with work, what would it be? A: It would be to shrink 5 inches at work. Everything is made for short people. Thank you, Andrew, for all that you bring to Lovejoy, and the SW Café kitchen! 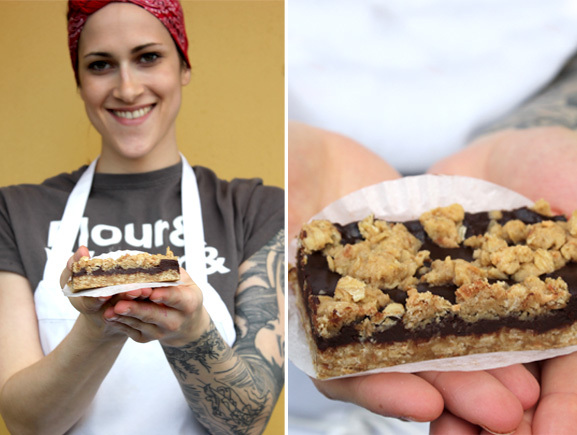 Meet Makenna Hale, maker and creator of the Hale Bar, a Lovejoy Baker’s vegan-friendly specialty. She also has crafted numerous Lovejoy goodies including the chocolate crinkle cookie, apricot almond bar, salted honey rose pie, chocolate hazelnut pie, and apricot oatmeal muffin. We applaud her tremendous contributions to our pastry case. Read below about this inventive baker, including her thoughts on bourbon and nutritional yeast. Q: Best music for baking? A: Blue Ivy Carter, because I could win her over with some desserts, and then she would have Beyonce and Jay-Z hire me as her personal Pastry chef. Q: If you were on a deserted island what’s the one ingredient you would bring? A: Nutritional yeast! Not to be confused with baker’s yeast. Nutritional yeast is delicious, and it’s a complete protein that has a lot of vitamins and minerals, which would be handy for survival. Q: Favorite random ingredient to add to bread/pastry? A: Liquor, when in doubt put some bourbon in it. Q: Favorite thing to spread and/or dip your bread in? One last detail about this baker: The Hale Bar is inspired by Makenna’s favorite childhood dessert (the oatmeal fudge bar) and the growing demand for heart-healthy vegan foods. This decadent bar has a pressed oatmeal crust that is covered with a house-made almond milk fudge, and topped with an oat & coconut crumble. Vegan or not, you must try the Hale bar!